If you believe in the power of numbers, Friday is a good day to sit up and pay attention. It's the eighth day of the eighth month of the eighth year of the millennium, an auspicious line-up of numerals if ever there was one. 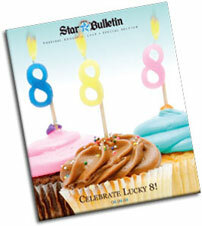 Thursday, look for our special section on the power of eight - including more stories of people turning 88 in time for this special day. The section will cover the importance of the number in Chinese culture, and many tales of how it has become part of our popular culture. Journey Down Under through the next Kahala Food & Wine Classic Sept. 12 and 13, when visiting chef Brent Savage and sommelier Nick Hildebrandt come to the Kahala Hotel & Resort from the Bentley Restaurant and Bar in Sydney. Savage's exotic fare will be paired with selections from winemaker Michael Twelftree of Two Hands Wines in Australia's Barossa Valley. The Aussies will join forces with Maui chef Beverly Gannon of Haliimaile General Store and Joe's Bar & Grill and Kahala Resort executive chef Wayne Hirabayashi. Cigar aficionado Michael Herklots of Davidoff of Geneva in New York and master of ceremony Fred Schrader complete the weekend full of dining, tasting and cooking instruction. 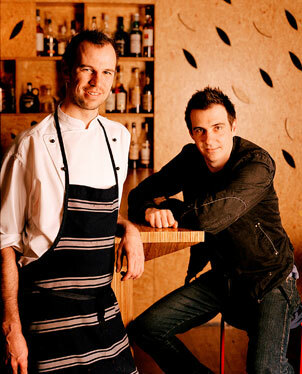 Chef Brent Savage, left, and sommelier Nick Hildebrandt of Bentley Restaurant and Bar in Australia will visit the Kahala Hotel & Resort in September. Walkabout -- A Progressive Dinner: Sample dishes from the chefs served on the resort's Koko Head lawn; 6:30 to 9 p.m. Sept. 12; $135. Barbie on the Beach: An interactive cooking class on barbecue, Aussie-style, led by Savage; 10 a.m. to noon, Sept. 13; $75. The Art of Cigar Blending and Tasting: Understand the science of using and appreciating the best tobaccos; 12:30 to 1:30 p.m. Sept. 13; $30, samples included. Wine-ology with Michael Twelftree: Taste six shiraz wines from Australia, and learn their regional subtleties; 2 to 4 p.m., Sept. 13; $50. Sinful Sydney -- A Decadent Journey of Food and Wine: Savage and Hirabayashi prepare a six-course dinner with wine pairings at Hoku's; 6:30 to 10 p.m. Sept. 13; $185. Puff'n Out-Back: Savor a smoke and a drink around the fire pit on the Koko Head lawn with Herklots; 10 p.m. to 12 a.m., Saturday, Sept. 13; $45, includes petits fours. Ports, cognacs, whiskeys and rums will be sold.